Slice the eggplant into regular slices. For best results, slice vertically: when sliced in this direction, the eggplant fibers soak up less oil when fried. Cover with coarse salt (more than you think you need), and place in a colander in your sink, to sweat out their water or bitter juices (30 to 60 minutes). This is important because if they are too juicy inside, they’ll soak up oil like crazy when fried. In the meantime, heat 8 tbsp oil in a saucepan, add 1 clove garlic and the tomato, salt, and cook on low/medium heat for 10 minutes until thickened, stirring frequently with a wooden spoon. Cook the pasta according to instructions and dry the sheets on kitchen towels. After allowing the eggplant slices to “sweat” for at least 30 minutes, rinse them very well, one by one under running water, rubbing them, and then rinse again (more than you think you need). Now dry them (again… more than you think you need!) with paper towel. Heat the frying oil in a deep pan (I know it’s scary, but use a ton of oil. Like, close to 1 quart. The less oil you use, the more oil the eggplant will absorb – because the oil temperature will be more likely to drop when you drop the slices in). If you like using food thermometers, heat the oil to about 330-340F, or just do what I do: test it by dropping a tiny cube of bread or eggplant into it, and if lots and lots of tiny bubbles form around it, you are good to go. Fry the eggplant slices in batches (do not overcrowd the pan, or you’ll lower the temperature of the oil, ending up with greasy soggy slices). Oh, and I almost forgot: use tongs to put the slices in the oil, they are too heavy to be dropped in without getting splashed with hot oil. Fry on both sides until golden, and dry them on several layers of paper towel. Feel free to press the paper towel into the eggplant if you want to remove even more oil. Chop finely, setting only 4 or 5 whole slices aside. Brush a baking pan with little oil and start with a thin layer of the tomato sauce. I like to use earthenware but other materials also work, and as far as size you can go with something about 12 x 9 ½ in. Combine the rest of the sauce with the chopped fried eggplant. 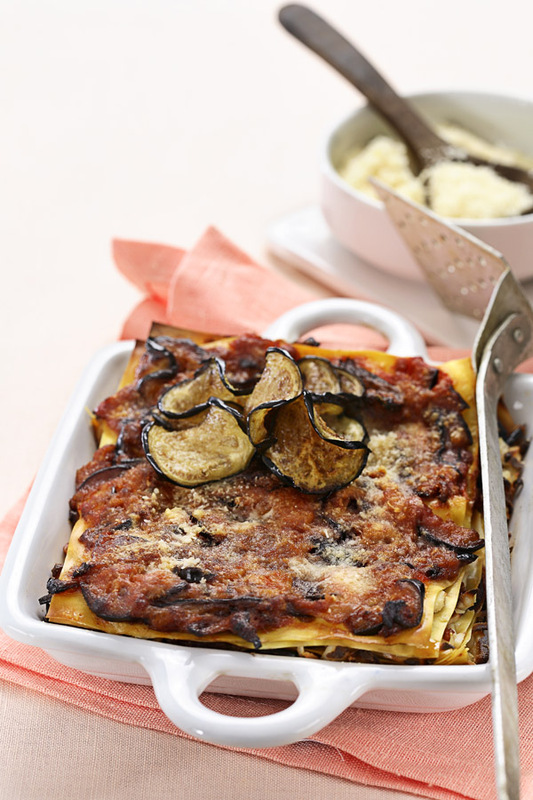 Alternate layers of lasagna, eggplant sauce, and ricotta, dusting each layer with little grated cheese. 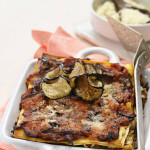 Decorate the top layer with the whole fried eggplant slices and extra grated cheese. Bake in a pre-heated oven at 350 F for about 30 minutes. One of the immediate consequences of receiving a Syntia machine as a thank-you token after my lecture for Lavazza Coffee and Philips Saeco at Eataly last September, was that I started putting espresso into everything. Literally: I experimented with stews, fish, fennel, fresh pasta, smoked cheese… with a couple of exceptions, everything seemed to taste more interesting. It’s probably because our sense of smell is responsible for about 4/5 of what we taste – that’s why we lose our appetite when we have a cold and our nose is blocked! With its intense and unique aroma, high-quality coffee is an extraordinary ingredient and can add sophistication to a variety of dishes, savory or sweet. However, I have to admit that it was its performance in desserts to really capture my culinary imagination. You see, I wasn’t really born with a sweet tooth and I can truly appreciate sugar only when I mix it with something different, whether it’s sour (lemon gelato), salty (chocolate pretzels! ), or bitter (any espresso-spiked desserts!). Tiramisu, one of the most recent and successful “classics” of Italian cuisine, is my favorite example of the perfect marriage of sweet and creamy (mascarpone, cream and sugar) with deep and bitter (espresso and unsweetened cocoa powder). A match made in heaven! Unfortunately, it’s a bit rich, and after seeing me down it for breakfast for three days in a row, my husband politely pointed out that I was showing clear signs of addiction. Switching to a ricotta-based coffee treat seemed like a better option if I wanted to indulge myself so often. Whole milk ricotta is a cheese by-product, not a cheese, and naturally low in fat and high in protein, while still very rich and creamy in texture (cannoli, anyone?). 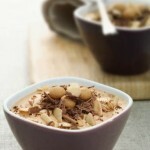 Let me know what you think of this espresso-spiked chocolate almond mousse. It’s light enough that you can enjoy it after a multiple-course meal without feeling too guilty! Separate the eggs. Beat the yolks with the sugar until light and frothy. Add the ricotta liqueur, coffee, cocoa and chocolate and combine well. Add the crumbled cookies. Beat the egg whites until stiff and incorporate them into the ricotta using a spatula. Pour the mix into individual bowls, and refrigerate for at least 2 hours. 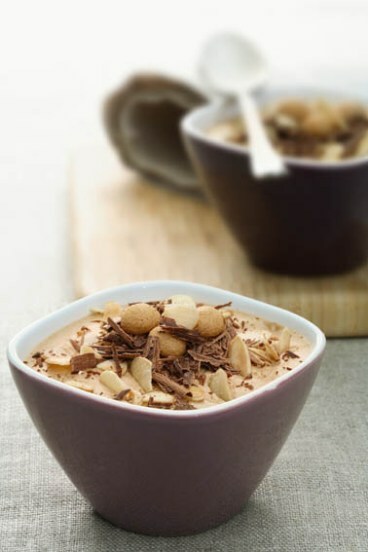 Decorate with chocolate shavings and slivered almonds before serving. some people are uncomfortable consuming raw and lightly cooked eggs due to the slight risk of food-borne illness. To reduce this risk, we recommend you use only fresh, properly refrigerated, clean grade AA eggs with intact shells. Still nervous? If using pasteurized eggs, it will be harder to beat the yolks frothy and especially to beat the whites stiff: for the yolks, you will just need to beat them longer with an electric mixer; as to the whites, you will need to add a touch of cream of tartar (or lemon juice or white vinegar); about 1/3 teaspoon cream of tartar or 3/4 teaspoon lemon for 4 whites. You will also need to use an electric mixer and beat for twice as long as you would with regular egg whites You can buy pre-pasteurized eggs in many stores (test are not the egg-beaters but actual whole eggs, that can be separated at home into whites and yolks); or you can pasteurize them following this method. * Disclosure: I was not paid for my review of the Philips Saeco espresso machines, apart from being given one Syntia machine to try and review. All comments are my own, honest opinion after my experience with the machine. Beets are native to the Mediterranean, but for a very long time people ate only their leaves, while the root was used in medicine to treat a variety of ailments. It was only in 19th century France that the beet’s culinary potential was discovered, while at the same time the Germans proved that it could produce sugar , making it an easy local alternative to the tropical sugar cane. Beets are in season from June through October , but they are easy to find throughout the year because, like other root vegetables, they store well. Their flavor is deep, sweet, hearty and rich, making them ideal for cold-weather recipes like this one. Cooking the beets whole is the best way to retain most of their flavor and nutritive value. In particular, roasting intensifies the flavor, and makes the peels easy to remove. Just cut off any greens, (you can cook them and eat them separately), scrub the beets clean, place them on a large piece of aluminum foil, fold and close the foil, and bake in a preheated oven at 375 F for 25 minutes to 1 hour (depending on the size). Bake the beet till soft . In the meantime, heat 1 tablespoon olive oil, add the leeks and cook the leeks for about 5 minutes. Set 1/2 of the leeks aside, and add the radicchio to the pan. 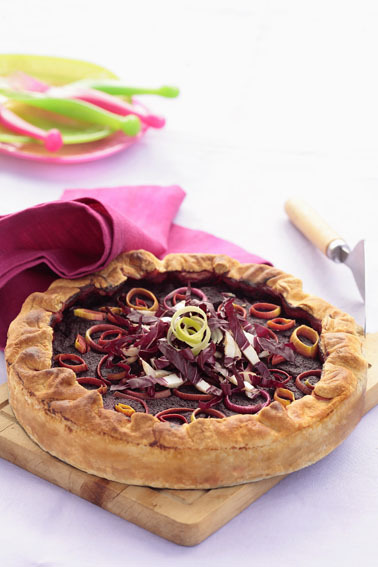 Cook most of the radicchio (save a little for decorating) with the remaining leeks for about 10 minutes, adding 1/4 cup of red wine if it's sticking to the bottom (or drizzle with little balsamic vinegar). 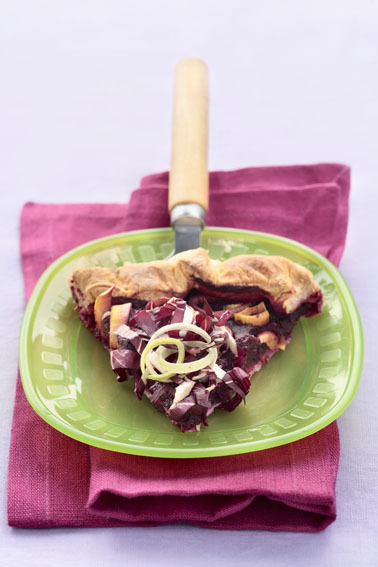 Process the cooked beet with 1/2 the cooked leeks, the ricotta, egg, cooked radicchio, salt and pepper to taste, and one tablespoon olive oil. Pre-heat your oven to 360 F; grease a baking pan or line it with parchment; roll out the pastry, cut it in a circle about 1.5" wider than the pan and place it in the pan. 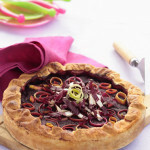 Fill the pastry with the mix of ricotta and vegetables, and add the remaining cooked leek on top. 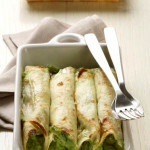 Fold the edges over, and bake for 20 to 30 minutes or until golden. Before serving decorate the top with the remaining radicchio. 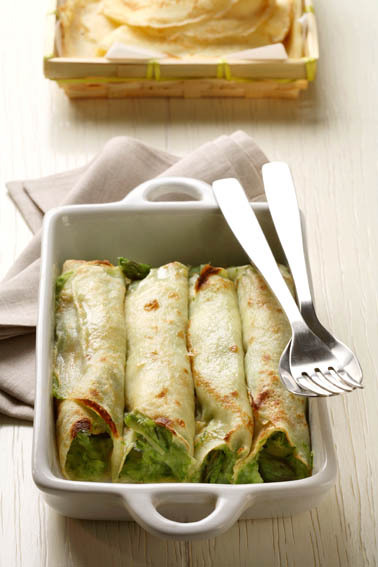 * For an even richer flavor you can add 2 tablespoons of grated parmigiano to there filling.